High feed speeds and large cutting depths as a result of modern technology applied to woodworking have made it necessary to deal with the problem of overheating and of the inner tension of the machine saw blades. A number of special features indispensable now in the woodworking industry, particularly in the saw mills, originated from these efforts. Cooling by slots and cutouts, improved clearance by raker teeth and their special position in the plate are marks of success in the fight against overheating of circular saw blades. Thus, it has become possible to retain the very important inner tension of circular saw blades even for a very long time of operation during which restraightening and retensioning is no more necessary. Untipped circular plate saws and gang saw blades are hardchrome plated so that they offer a longer service between resharpenings. In our own modern hardchrome plating facilities the hardchrome thickness can be kept at the desired constant level so ensuring that resharpening is only necessary at the very longest intervals desirable. Measures for the conservation of environment comprising noise reduction are increasingly welcomed. The disturbing and harmful noise by high sound intensity levels of circular saw blades has always been a nuisance in the woodworking industry. In cooperation with the Technical University Braunschweig we have developed a sound damped carbide tipped circular saw blade so making an important contribution against noise pollution. Special emphasis has been given to the field of gang saw blades and the auxiliary suspension equipment for the saw mill industry. The special Ti-design for gang saw blades making retensioning dispensable and increasing the long-term efficiency substantially. A new fully automatic hydraulic tensioning system waiving the tedious manual pretensioning of the eccentrics by hand. Due to their ingenious design Felde products such as machine saws, machine knives, suspension systems and other equipment for the saw mill industry will give an optimum efficiency to the industrial user. 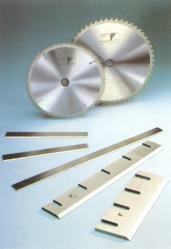 Even at very difficult cutting conditions, for instance when cutting large depths of wood at the quickest possible feed speeds our machine saw blades will perform with a very small loss of cut yielding a smooth surface finish of the wood and causing a minimum down-time thus constituting low-cost purchases. 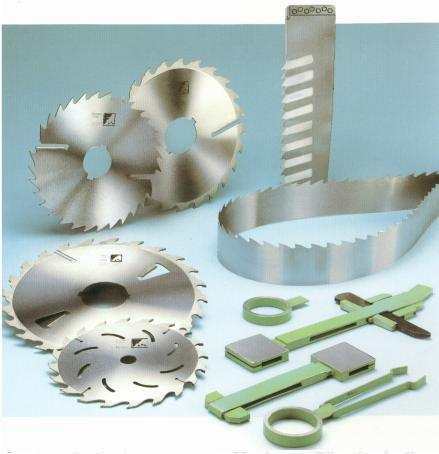 It is the special rip cutting circular saw blade which is increasingly used for the cutting of small and medium diameter soft wood trunks due to the advance of the profiling technique in the saw mill industry in the past years. Installed on heavy duty woodworking machines such as double arbour machines and log slabbers our special circular saw blades with rakers have proved to be the best procurable. Felde products used on saw mill machines such as edgers, multiple saw machines and high duty gang saw and band saw machines cut the cost of production substantially.